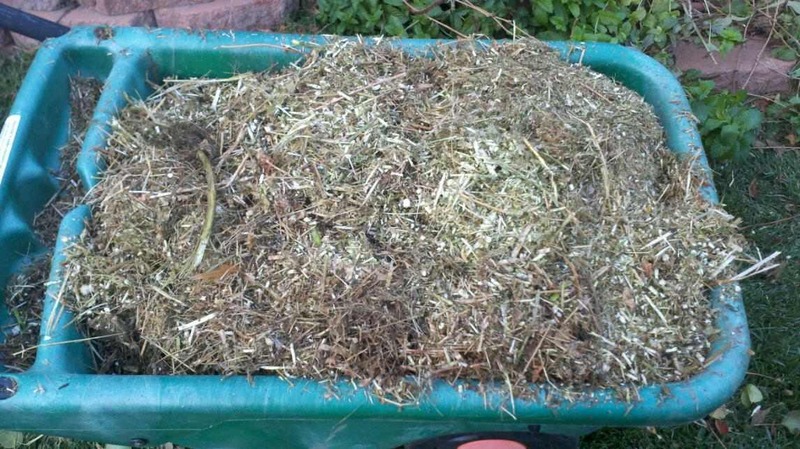 Faced with a mountain of yard waste and an average-sized compost bin, the Sergeant and I looked into renting a chipper-shredder. 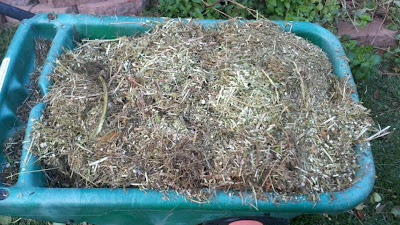 It's a shame to throw organic stuff in the dumpster, but a lot of it is just too big to compost easily. Home Depot only had the industrial-sized kind used by tree services, and the cost was more than $100 a day. After I asked for advice on my gardening listserv, a member offered to sell us her 10hp model. 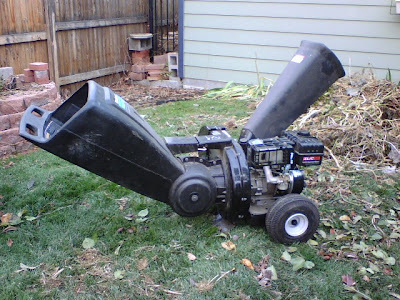 She'd hardly used it, and stopped altogether once Boulder started a city composting program. This stuff will make great mulch and break down nicely. The shredder's chutes come off, so it won't be hard to store. It's a very satisfying thing to have. 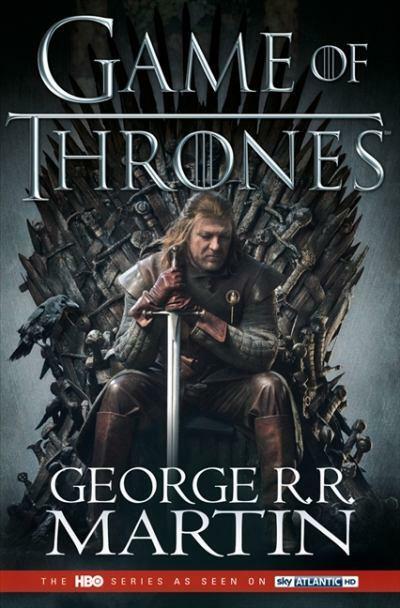 I'm getting close to the end of the second book of George R.R. Martin's "Song of Ice and Fire" saga, which I started this summer after reading a New Yorker piece about his fans. 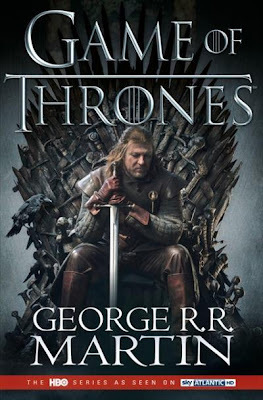 Many of them were angry over how long it was taking him to write the next installment in the series (the fifth and latest came out this summer; he projects there will be seven total). This hugely elaborate project is all about the machinations of those who would be king in a made-up country that is a lot like Arthurian England. Each chapter focuses on a particular character (and usually ends with a cliffhanger); you get the overall arc of the story by following each of the characters' threads. It's quite engaging, and there are some good plot twists. 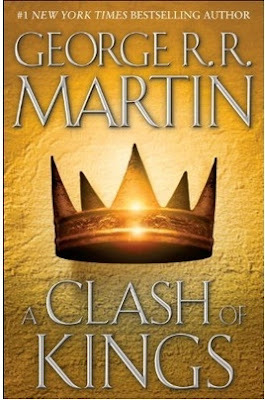 I am going to try to spread out my reading of it a little and hope the author can finish the series! A little bit of fluff I whipped through in a couple of days was "And My Shoes Keep Walking Back to You" by Kathi Kamen Goldmark. The protagonist is a backup singer in a country band who starts to achieve some fame of her own while also dealing with the vagaries of love and family drama. 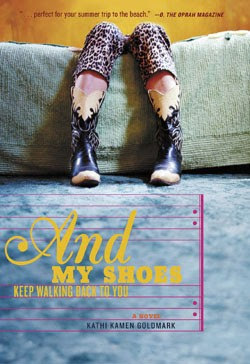 If you like country music and entertaining lyrics, this would be a fun book for you to check out. I also finally tackled "The Story of Edgar Sawtelle" by David Wroblewski. It's set in Northern Wisconsin and has dogs, so I was predisposed to like it. (I grew up in Wisconsin and, well, you know me and dogs.) I don't want to outline the plot, since I think it's better to discover that on your own. 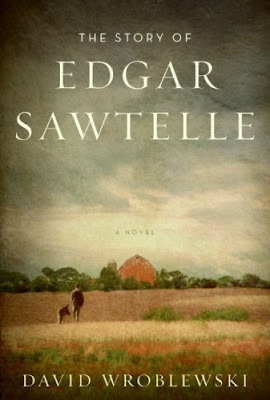 I did like the book, a lot, until halfway through, when there's a moment of deus ex machina that really ticked me off. I found the story really interesting and believable up until that point, but this little twist just threw me right out of the story. I finished it, and I still liked some aspects of it, but I found it fundamentally flawed. It made me really miss my old Sophie dog, too. She was smart on the level of the dogs in the story. If you love dogs, this book will make you cry. The Sergeant and I had lunch this afternoon at Falafel King, a small, local chain. They have a bewildering array of options, but it's all good, and fast. 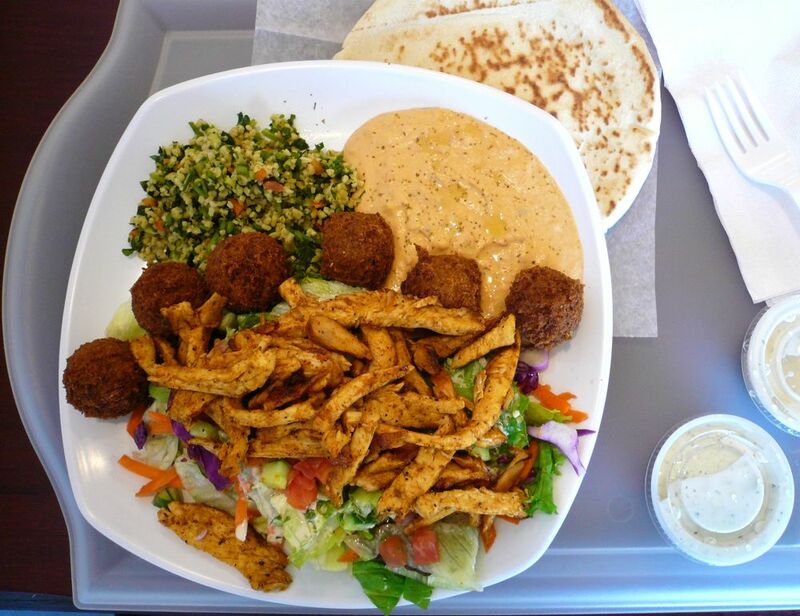 I got the grilled chicken plate, which comes with six falafels, salad and two sides and pita bread. Very yummy. The marinated chicken is grilled as you wait, and served atop the salad. I got tabouli and hummus as my sides. 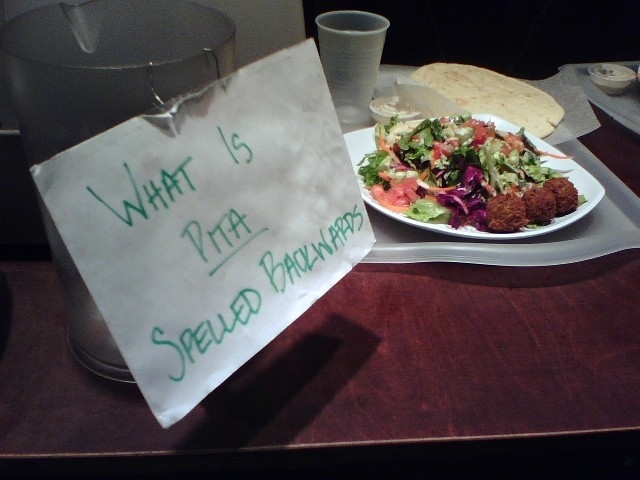 The tabouli is especially good. Nice and lemony. The note next to the register was amusing. It took me a second to get it. "Snow astronaut." That's what the Sergeant called this photo when he emailed it to me. 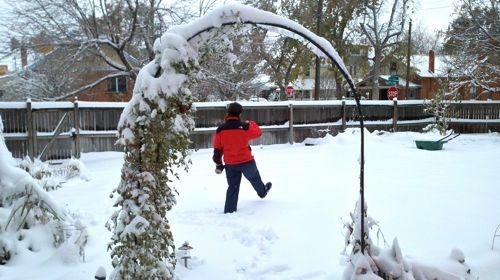 I was in the back yard this morning trying to take a picture of stepping into the snow. It didn't turn out. Yes, we got more snow. Maybe 5 inches or so. C'est la vie. It'll melt quickly. My month of daily blogging is over. It wasn't that hard to toss something out there every day. If you take a lot of photos, you can usually find one that will help carry a post, even if the writing's not very compelling. If a post is not interesting in some way, why bother?